Traditionally community has been defined broadly as a group of people formed around either a location or social relationships. Even before online communities were added to the mix, there were a multitude of definitions for community. With changing connections come new ideas about community, and I’ve been developing my understanding of community with a twist of networked individualism. Networked individualism uses social network theory to identify social connections. In the study of social networks, a community is one type of social network that is identified through empirical analysis. These dense social networks are identified from the inside out, by following the relations and ties out from one individual to others and finding intersections. 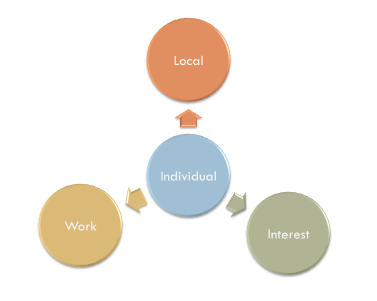 Communities are typically studied from the outside in, targeting a group and then looking at the members within it. In my dissertation research I melded the two areas by targeting a specific type of communityâ€”World of Warcraft guildsâ€”and then following the individual members out to other communities in which they participated. Communities are entities with distinct histories that can contain transient or permanent. They can be identified by following empirical analysis of networks. Social network theory concentrates on the networkâ€™s structure and ties, but loses sight of social relationships and benefits. The cognitive and emotional aspects of community important to psychological research can be reintroduced through participant identification of community. Shared histories, places, time together, and experiences are only one part of sense of community. By asking individuals to self identify communities belonging, sense of mattering, and feelings that needs will be met are included in defining the communities. In this way, we can include cognitive and emotional aspects of community to identify community from within the frame of networked individualism.